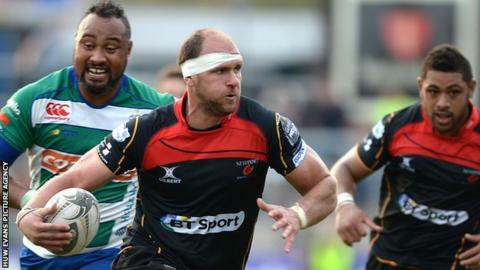 Newport Gwent Dragons' South African second-row Rynard Landman says he would "play his heart out" if selected by Wales once he becomes eligible in 2017. Landman joined Dragons from Super Rugby side Cheetahs on a three-year contract in 2014. The 28-year-old can play for Wales once he has lived there for three years. "I'm here to stay and, if it comes along my path in three years, I would accept it with open arms and play my heart out," said Landman. The lock, who can also play in the back row, has captained Dragons during his debut campaign at Rodney Parade. "My first priority was the Dragons contracting me so if I can play international rugby, I think that is every rugby player's dream," he said. "If it's for South Africa, if it's for Wales... I'm here at the moment. I think I had my chance with South Africa. "It's not nice for people to come in or let foreign players come in and play here, but they gave me the opportunity."